Leap All Video Converter Platinum is an all-in-one video converting tool with easy-to-use interface, fast converting speed and excellent output video quality. It allows you to effortlessly convert video files between all popular video formats. 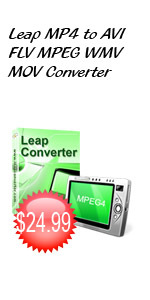 Leap MP4 FLV MPEG WMV ASF MOV to AVI Converter is powerful and comprehensive video conversion software that makes it easy to convert popular video files to AVI video formats. Leap AVI to MP4 FLV MPEG WMV MOV Converter is excellent AVI video conversion software. Leap AVI FLV MPEG MP4 ASF MOV to WMV Converter is professional, easy to use, and comprehensive video conversion software that makes it easy to convert popular video files to WMV video formats. Leap WMV to AVI FLV MPEG MP4 MOV Converter is the best WMV video conversion software with easy-to-use interface, fast converting speed and excellent output video quality. Leap AVI FLV MPEG WMV ASF MOV to MP4 Converter converts your videos quickly and easily into MPEG-4 that MP4 player or Zune, iPhone player can play. Leap Mp4 to AVI FLV MPEG WMV MOV Converter is powerful and easy to use MP4 converter software which help you convert MP4 to AVI, MP4 to WMV, MP4 to VCD, MP4 to SVCD, MP4 to DVD, MP4 to iPhone, MP4 to Zune, MP4 to FLV, MP4 to SWF and MP4 to MOV. Leap FLV to AVI WMV DVD MPEG MP4 MOV Converter is powerful and easy-to-use FLV converter software which helps you convert FLV file to other popular video formats such as FLV to AVI, FLV to MP4, FLV to WMV, FLV to VCD, FLV to SVCD, FLV to DVD, FLV to iPhone, FLV to Zune, FLV to SWF, and FLV to MOV. Leap AVI WMV DVD MPEG MP4 MOV to FLV Converter can convert all popular video formats such as AVI, WMV, MPEG, MP4, ASF, VOB, 3GP, iPhone, MOV, FLV to FLV, SWF video files. Leap AVI FLV MPEG WMV ASF 3GP to iPhone Converter converts your videos quickly and easily into the format that your iPhone can play. Leap iPhone to AVI FLV MPEG WMV 3GP Converter can help you convert your iPhone video file to AVI, MP4, WMV, VCD, SVCD, DVD, iPhone, Zune, FLV, SWF and MOV video formats. Leap AVI FLV MPEG WMV ASF MOV to Zune Converter converts your videos quickly and easily into the format that your Zune can play. Leap All to DIVX MPEG FLV MOV WMV Converter can convert diverse videos as AVI, WMV, MPEG, MPEG4, ASF, VOB, 3GP, iPhone, MOV, FLASH to popular videos as AVI, DIVX, MPEG4, WMV etc with high speed and good quality.Such as WMV to AVI,FLV to AVI etc. Leap All to MP4 3GP iPod iPhone Converter includes the ability of converting all videos to MPEG4, 3GP,iPhone, iPod, Zune easily and effectively.Such as AVI to MPEG4,MPEG to iPhone,3GP to iPod,FLV to Zune,FLV to MPEG4 etc. Leap Youtube FLV to iPod iPhone MP4 Converter can download YouTube video free to your computer, and convert YouTube videos to popoular videos as MPEG4,3GP,iPhone,iPod,Zune.Such as FLV to MPEG4,FLV to 3GP,FLV to iPhone etc without any quality loss. Leap Youtube FLV to AVI WMV MPEG Converter can download videos from YouTube easily also convert FLV to popular videos as AVI,MPEG4,WMV,VCD,DVD,SVCD with high speed and good quality.As FLV to AVI,FLV to MPEG4,FLV to WMV etc. Leap YouTube to 3GP Xbox Psp Zune Converter is a powerful and professional Converter and downloader to download videos from YouTube.com and convert with ease to MPEG4,3GP,Zune,Xbox,Pmp,Psp etc with high quality.As FLV to Apple tv,FLV to 3GP etc. Leap DIVX to MP4 iPod iPhone Video Converter has professional and easy-to-use interface, fast converting speed and allows you to effortlessly batch convert AVI,DIVX to diverse videos as AVI, MP4, WMV, DVD,FLV etc.As DIVX to FLV,DIVX to MP4 etc. Leap MP4 AVI iPhone to DIVX Video Converter has easy-to-use interface but has powerful functions.It can batch convert diverse popular videos as AVI,WMV,MPEG,MPEG4,ASF,FLV etc to AVI/DIVX with high quality and fast speed.As FLV to AVI,MP4 to DIVX etc. iPhone,MOV to AVI,MPEG4,WMV,VCD,SVCD,DVD,3GP,iPod etc with high speed and good quality.As MPEG4 to AVI,VOB to FLV,3GP to MOV etc.